Yuma, Arizona, located in the southwest corner of the state, has so much to offer travelers as a tourist destination and it’s an easily accessible getaway from many major southwestern cities—only about a 3-4 hour drive from San Diego and Phoenix and about 5 hours from LA. It’s also a popular winter destination for snowbirds escaping the chilly climes of Canada and the northern US. We visited Yuma two years ago and were thrilled to return recently with a group of travel writers from the International Food, Wine & Travel Writers Association. 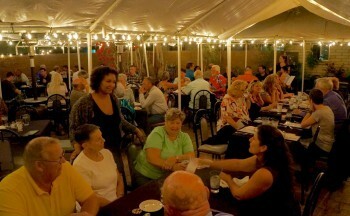 We found out that Yuma just gets better and better, particularly when it comes to its dining options. For a high-end dining experience, try the River City Grill. Its enticing and diverse menu features Mediterranean, Pacific Rim, Caribbean and Indian dishes, which are creatively prepared with an emphasis on fresh, seasonal ingredients. I tried a traditional garlicky Caesar salad with crisp romaine, homemade croutons and a light, refreshing dressing. Others at our table enjoyed Asian, Mediterranean and Spinach salads. For my entrée, I savored a beautifully presented and delectable, mustard-crusted halibut with spinach ricotta ravioli. My dining companions also raved about their dishes, including a lovely bouillabaisse, a tangy Indian curried shrimp, and a flavorful rack of lamb. 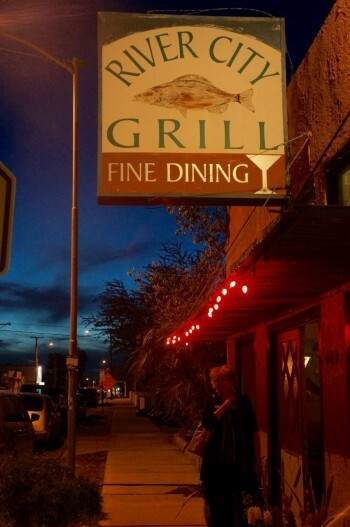 The River City Grill offers a beautiful outdoor dining patio or a cozy indoor dining room in the inviting bar area. I would highly recommend this restaurant for gourmet, romantic dining. 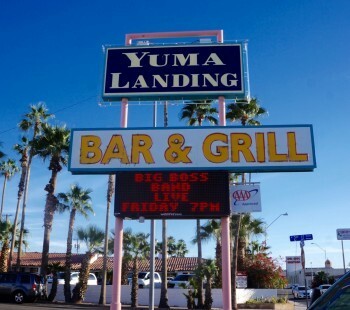 The Yuma Landing Bar and Grill is one of our favorite spots in Yuma. 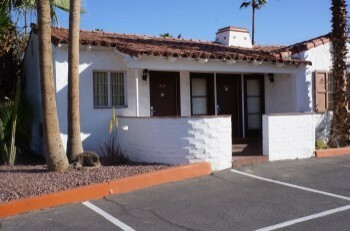 Since it is part of the historic Coronado Motor Hotel where we stayed during both trips to Yuma, we are happily familiar with the restaurant’s extensive menu. Breakfast is included for hotel guests and we loved the bountiful, appealing breakfast menu with everything from design-your-own omelets to eggs benedict, French toast and pancakes. For lunch or dinner, you’ll find a full menu of appetizers, salads, sandwiches, steaks and pasta dishes— all delicious. The adjacent Captain’s Lounge is the perfect setting to relax after a day of sightseeing. While sipping a handcrafted cocktail, you can peruse a fascinating display of historic photos depicting Yuma’s rich aviation history. You’ll discover that in 1911 the first plane to ever land in the state of Arizona did so right where this restaurant stands, as memorialized by a statue of the pilot, Robert Fowler, which stands in front of the restaurant today. This friendly place is certainly a few steps up from your typical sports bar, but it is still casual with a fun vibe. 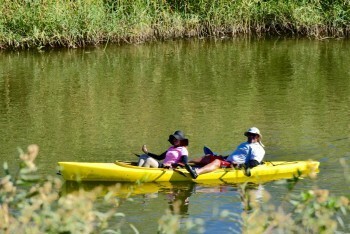 John and Yvonne Peach, the personable owners of both the hotel and the restaurant, are gracious hosts. They will even take you on a tour of the hotel’s own unique museum commemorating the early history of the hotel and Yuma. The hotel may be historic, but it is comfortable and completely updated with all the amenities you would expect in a fine hotel. You cannot pass through Yuma without stopping at Lute’s Casino (which is a bar and restaurant, not a casino) located in a one-hundred-year-old building on Main Street in the heart of downtown. This colorful spot, described as the oldest pool hall in the Southwest, is chock full of Yuma memorabilia with a down-home, cowboy atmosphere. Look for posters autographed by Marilyn Monroe and Clark Cable. Everyday the much-beloved piano player, Steve Embry, plunks out tunes while waiters scurry around with plates piled high. The menu is varied and the food good. I recommend a huge tasty Margarita and Lute’s signature potato tacos or a Rueben or tri-tip sandwich. On most days, you can find the owner, Bob Lute, hobnobbing with guests. 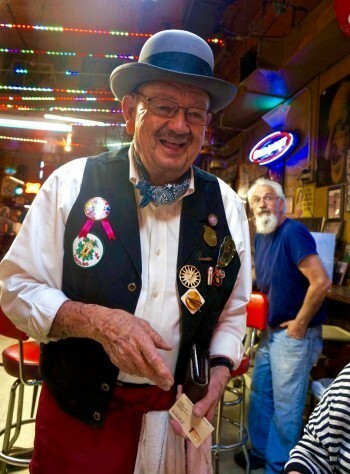 (And if you are a lucky lady who catches Bob’s eye, he may give you a keychain saying “I said no to Bob at Lutes Casino.”) I guarantee that you will never forget this iconic Yuma place. Sometimes there is a line outside, but it goes fast and is worth the wait. In this case, I’m not talking about Mexican but about a wonderful German restaurant called Das Bratwurst Haus. It is such a surprise to find authentic German food in Arizona. 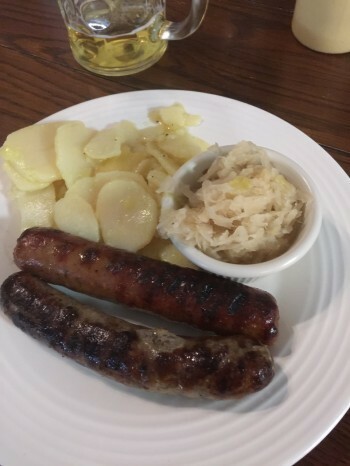 We are accustomed to great German food because of the many years we spent in Milwaukee, a city with a deep German heritage that has some excellent German restaurants. 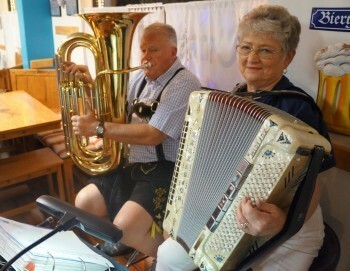 At Das Bratwurst Haus, while a lively German “oompah” band plays, you can enjoy just about any traditional German dish you desire. I savored wonderful Jager Schnitzel while others enjoyed Schnitzel Cordon Bleu, Sauerbraten and old-style potato pancakes called Kartoffel Puffer. The desserts were also heavenly, particularly the black forrest cake and apple strudel. The owners are Bill and Barbara Bowles. Barbara runs the kitchen and serves authentic dishes that she learned to cook while growing up in Bavaria. As a testament to the charm and appeal of Das Bratwurst Haus, some members of the celebrated Blue Angels flight crew were also enjoying the German food the night we were there. Since the Blue Angels are frequently stationed nearby, this is one of their favorite dining spots. We particularly loved meeting the first woman Blue Angel, Marine Captain Katie Higgins, who spent some time talking with us. This just topped off an already impressive evening. You never know who you’ll meet in Yuma. Das Bratwurst House is closed during the summer months. It is open from October through April. After contemplating the hard life at the Territorial State prison, you are going to need a beer and we have two places to recommend. Prison Hill Brewing Company is the only brewery of any kind within about 200 miles and the handcrafted beers were flavorful and refreshing. I recommend trying a unique and tasty sampler to appreciate the wide variety of beers available here. While we only tried the beer, word has it that their food is also delicious. Right across the street is the Pint House Bar and Grill, where we stopped the last time we were in Yuma. This is also a great place with an extensive beer selection and good food. 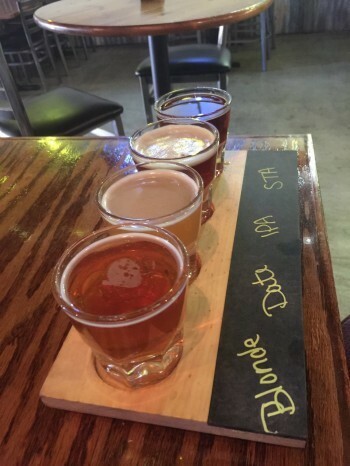 On the same stretch of Main Street as these two beer stops, Yuma's Main Squeeze is also a local favorite because of its welcoming ambiance in a lounge-type setting with both indoor and patio sipping and dining available. 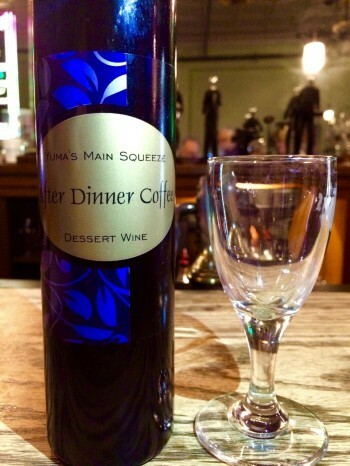 It serves appetizers, pizzas, panninis and small dishes while featuring wines made locally from imported grapes. This would be an ideal place to linger for a while after a hard day of sightseeing. 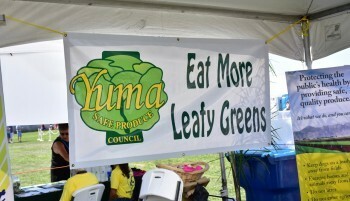 A highlight of our recent visit to Yuma was Lettuce Days, a two-day, agri-culinary festival featuring live cooking demonstrations, impressive equipment displays, and food and beverage tastings. You could even pick your own lettuce at this event held at the University of Arizona’s Agricultural Center. Yuma is a natural place for this festival since we learned that 90 percent of the country’s winter lettuce is produced from this fertile agricultural region. There are many other food-centric festivals and events held in Yuma throughout the year, including the annual Tunes & Taco Festival (April 9), the Somerton Tamale Festival, German Fest on Madison, Yuma Medjool Date Festival, Kamman Sausage Fry, and Scandinavian Festival. For more details and dates, go to the VisitYuma.com website. 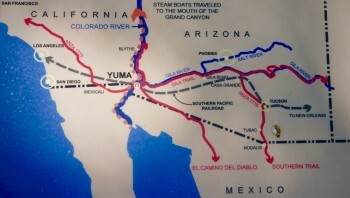 For an earlier article we published about what to do in Yuma, click here. Photos with this article taken by Todd Montgomery.